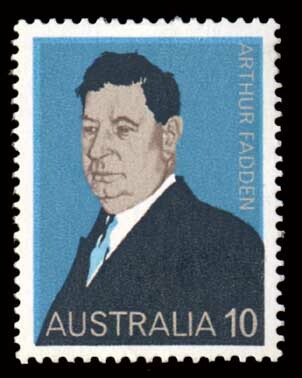 Sir Arthur William Fadden, GCMG (13 April 1894 – 21 April 1973) was an Australian politician and the 13th Prime Minister of Australia. Fadden was born in Ingham, Queensland, on 13 April 1894 the son of a Presbyterian police officer. He was educated at state schools, and later studied accountancy while working as a clerk. Once he had qualified he became assistant Town Clerk of Mackay, then Town Clerk. In 1919 Fadden helped form the North Queensland Rugby League, and served as its founding secretary. In the 1920s he established a successful accountancy firm with offices in Brisbane and Townsville. He was active in the Country Party from its foundation. In 1932 Fadden was elected for one term to the Legislative Assembly of Queensland as member for Kennedy. He was defeated in 1935. The following year, though, he won a by-election in the federal seat of Darling Downs. He was a blunt, effective debater and soon made an impression. When Archie Cameron resigned suddenly as Country Party leader in 1940, there was a deadlock between Earle Page and John McEwen in the ballot to select a new leader, and Fadden was chosen as a compromise candidate. He was appointed Minister for Supply and Development, then Minister for Air, then Treasurer (finance minister). In August 1941 Robert Menzies resigned as Prime Minister and leader of the senior party in the coalition, the United Australia Party (UAP). Although the non-Labor Coalition had been in power for a decade, the UAP was so bereft of leadership that it was forced to elect former Prime Minister Billy Hughes as its new leader. Under normal circumstances, this would have made Hughes Prime Minister for a second time. However, Hughes was a month shy of 78, and was viewed as too old and frail to be anything other than a stopgap leader, especially during wartime. Under the circumstances, on 28 August a joint UAP-Country meeting chose Fadden as Coalition leader even though the Country Party was the smaller of the two non-Labor parties. Fadden was duly sworn in as Prime Minister the next day, and also remained as his own Treasurer. He was the only member of the Country/National Party to serve as Prime Minister without an expectation of a short tenure; the other two Country/National Prime Ministers, Page and McEwen, served as caretakers. In the event, however, Fadden's tenure was short-lived. On 3 October, the two independent parliamentarians who had been keeping the Coalition in office for the last year, Arthur Coles and Alex Wilson, voted against Fadden's budget. Coles and Wilson had been so disgusted with how Menzies had been treated that they refused to support the Coalition any longer. Due to this loss of supply, Fadden submitted his government's resignation to the Governor-General Lord Gowrie later the same day. This was the last occasion to date on which an Australian government was forced to resign after being defeated on the floor of the House of Representatives. Fadden joked that he was like the Flood: he had "reigned for 40 days and 40 nights". Gowrie then summoned Coles and Wilson and demanded that, if he commissioned opposition leader John Curtin as Prime Minister, they would support him and end the instability in government. Coles and Wilson agreed to this, and Curtin was sworn in on 7 October. A joint UAP-Country Party meeting endorsed Fadden as Leader of the Opposition, even though the UAP was nominally the senior coalition partner. The Coalition sank into near-paralysis in opposition. Even allowing for the significant advantages an incumbent government in a Westminster system has in wartime, Fadden was unable to get the better of Curtin. The Coalition suffered a crushing defeat in the 1943 election. It was reduced to 19 seats, including only seven for Fadden's Country Party. Accepting responsibility for this severe defeat, Fadden then handed the Opposition leadership back to Menzies, who had resumed the UAP leadership. After the Coalition was again consigned to opposition in the 1946 election, Fadden resumed his political partnership with Menzies. Two years earlier, Menzies had folded the UAP into the new Liberal Party of Australia. There was some speculation that the Country Party would be included in the merger (as had already happened in several states), but Fadden was keen to assert the independence of his party. Always an outspoken conservative, in the late 1940s he became a strong anti-communist, urging Menzies to ban the Communist Party if he ever came to power. Indeed, in the lead up to the 1949 federal election, Fadden often made inflammatory claims about the "socialist" nature of the Labor Party which Menzies could then "clarify" or repudiate as he saw fit, thus appearing more "moderate". His often extreme views were concealed behind a jolly public manner and he enjoyed his nickname "Artie." Fadden was a friend of Robert Frederick Bird Wake, one of the country's leading security experts at the time. It was an odd relationship, based on their mutual love of Queensland and Queenslanders. Wake, who was a founder director with the Australian Security Intelligence Organisation (1949), was supplied with inside information by Fadden about security leaks in the UK. Although Wake was more inclined to support the Labor Party, the relationship stood the test of time and proved mutually beneficial. The Coalition won a massive victory in the 1949 election, and Fadden, who transferred to the newly created seat of McPherson on the Gold Coast, became Treasurer in the second Menzies government. Although inflation was very high in the early 1950s, forcing him to impose several "horror budgets," he generally presided over a booming economy, with times especially good for farmers. He retired before the 1958 election and lived quietly until his death in Brisbane in 1973. Fadden was made a Knight Commander of the Order of St Michael and St George (KCMG) in 1951. The honour was conferred upon Fadden by King George VI in London on 31 January 1952, only a week before the King's death. In 1958 Fadden raised to Knight Grand Cross (GCMG) of the order. The Canberra suburb of Fadden and the Division of Fadden are named after him. Wikimedia Commons has media related to Arthur Fadden. This page was last modified on 12 January 2016, at 02:37.